The Far West Local Health District has congratulated Balranald school student Tearra Charles who has been named 2016 School Based Apprentice/Trainee of the Year for the Riverina Region. The Balranald Central School Year 12 student was a finalist in the Riverina NSW State Training Awards, along with fellow student Samantha Renfrey. Both are enrolled as School Based Apprenticeship and Trainees (SBATS) with the health service and both complete their on-the-job training at the Balranald Multi-Purpose Service. Tearra is completing a Certificate III in Health Services – Nursing Assistance with the Far West Local Health District. 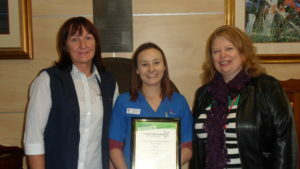 Balranald MPS Health Service Manager, Ms Patricia Croft (left) and Ms Stobon Lloyd , Careers Adviser at Balranald Central School, with Tearra Charles and her TAFE Award. Balranald Central School currently has four SBATS students working at the Balranald MPS. “This was a fantastic achievement for Tearra and Samantha to be finalists in the Riverina NSW State Training Awards and a credit to them for their hard work and commitment as SBATs students,” said Mr Timothy O’Neill, Manager Nursing Leadership & Workforce Development, Far West LHD. Tearra now has the opportunity to interview for the NSW state award. These interviews will be conducted in July. “We wish to congratulate Tearra on winning the top award in her category for the Riverina Region and wish her all the best in the NSW State Awards,” said Mr O’Neill. Far West LHD launched the SBATs program in 2014 with ten students participating from across the District in traineeships in Business Administration (medical), Health Services Assistance, Allied Health Assistance and Aboriginal Primary Health Care. Traineeships were offered in locations where the health service had a capacity to support the students. The SBATs students gain an industry recognised qualification in their respective job role whilst completing their HSC. They undertake 100 days paid employment with their respective health facility.